I Don’t know why I doodled the cat and mouse on the end page of the short Julian Barnes essay “Literary Executions,” why that duo instead of, say, a dog and sheep, or a dog and elephant—after all, no cats are mentioned in the essay. I can’t say why, but I’m willing to speculate. The essay, collected in The Writing Life: Writers on How They Think and Work, is about the burdens of being the literary executor for a friend of Julian Barnes, author Dodie Smith (Dear Octopus, Capture the Castle, The Hundred and One Dalmatians, etc.). One of his executor responsibilities involved deciding whether or not it was proper to sell reprint rights to Japan, given that in life Ms. Smith had objected to such a deal because she believed the Japanese had a fondness for dogs fried, baked and par-boiled. (According to the essay that report was untrue, it was actually the Chinese who savored canine meals.) Meanwhile, the only direct connection between my doodle and the essay was that the essay mentioned, in passing, that mice had chewed the corners off some of Ms. Smith’s manuscript pages. Might my doodle mouse be explaining to the cat why he did that? But why a cat? Why not have the mouse explain its misdeed to a dog, one of the potential victims mentioned in the essay? 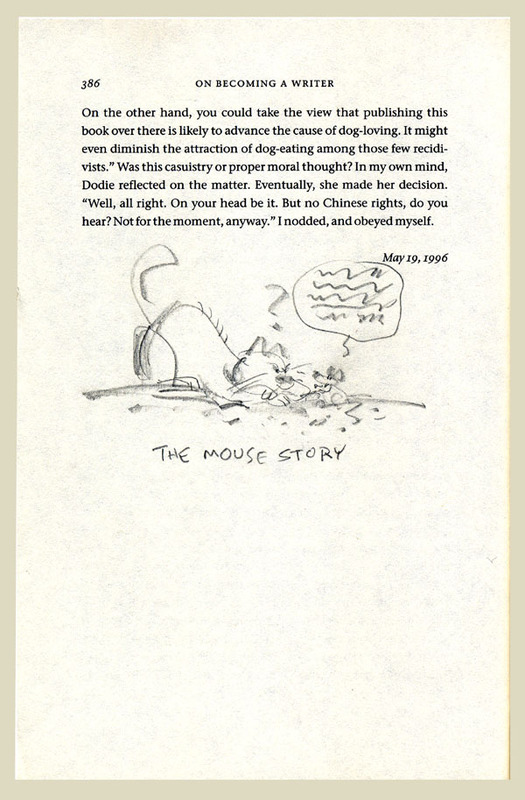 “The Mouse Story” is the third in a series of occasional posts under the title Marginalia. In these posts I’ll display and comment upon a page scan from one of my personal library books, on which I’ve doodled and/or underlined—or, as some would claim, otherwise defaced, a scared text (to the true bibliophile all text is scared). These folks, shocked by the desecration, predict (and seem to wish), that I will suffer some vile punishment for my transgressions. Copyright © 2008 Jim Sizemore. This entry was posted on Wednesday, October 8th, 2008 at 2:04 pm and is filed under cartooning, doodles, fiction, non-fiction, writing. You can follow any responses to this entry through the RSS 2.0 feed. You can leave a response, or trackback from your own site.